"These HEROES are home, they may Rest In Peace, and hopefully their families can have closure," the president tweeted. President Donald Trump on Thursday identified the remains of two American servicemen who were killed during the Korean War and whose remains were returned by North Korea two months ago following Trump's summit with Kim Jong Un. The president says: "These HEROES are home, they may Rest In Peace, and hopefully their families can have closure." 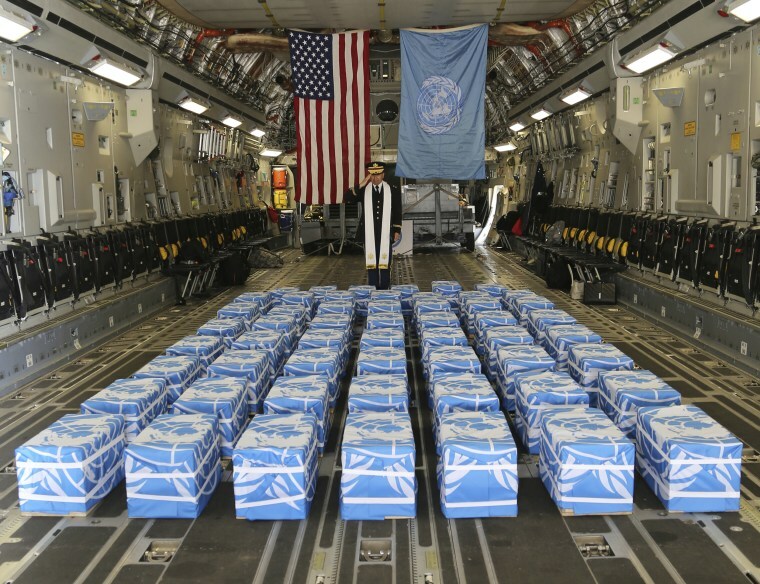 McDaniel's name had been made public last month because his military identification tag was among the 55 boxes of remains that North Korea turned over on July 27. A senior Pentagon official said the U.S. hopes to begin face-to-face negotiations with North Korea next month on terms for resuming on-the-ground searches in North Korea for remains of American servicemen. The official, Kelly McKeague, told reporters the aim is to begin searches next spring if agreement can be reached on areas of dispute such as the kinds of amounts of compensation to North Korea.